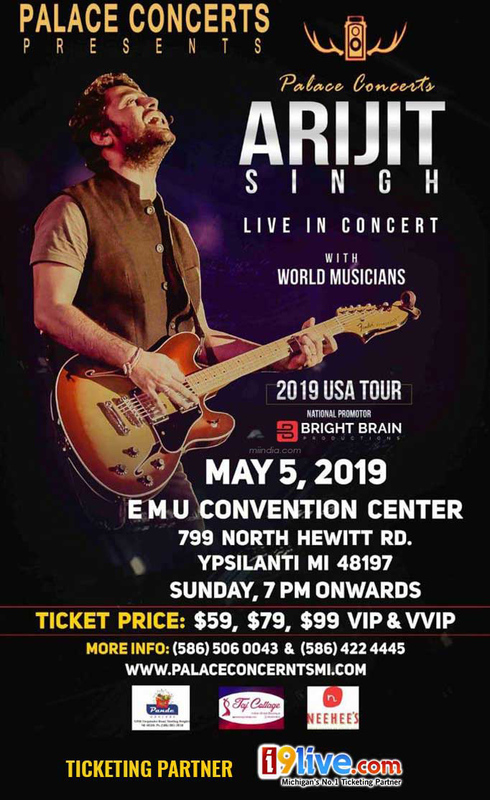 Arijit Singh Live-in Concert in Michigan - 48 HOUR TICKET DISCOUNT HURRY!! Easter Special. Get 15% Off each ticket. use the code - EASTER15. Palace Concerts presents Arijit Singh Live-in Concert with World Musicians. Attention, fans and friends – Arijit Singh has a big announcement! Due to an unanticipated technical difficulties on the behalf of the concert venue, Palace Concerts LLc has decided to move our concerts to the EMU Convocation Center, Ypsilanti, as this will offer an overall better concert experience for not only our attendees, but also our guests and artists. All reservations made for concerts seating have been transferred to the new venue and will reflect same section and price. But ticket must be exchange prior to show. You can exchange new ticket by phone call to Deepak Kumar 586-506-0043 or by email at ArijitMay5@yahoo.com. We wholeheartedly apologize for any inconvenience that this move may cause, but we assure our FANS that it is all with their best interests in mind. Thank you so much to everyone for helping us organize this larger venue and creating an even better concert experience. We can't wait to see you all on Sunday, May 5th, 2019!